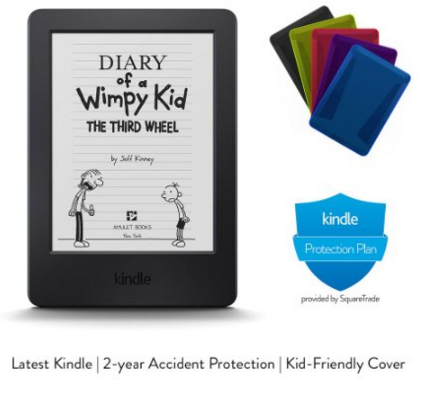 Kindle For Kids Bundle With Kid-Friendly Cover Just $90 Down From $140! You are here: Home / Great Deals / Amazon Deals / Kindle For Kids Bundle With Kid-Friendly Cover Just $90 Down From $140! Head over to Amazon and score this fantastic deal for your little reader on Kindle For Kids Bundle With Kid-Friendly Cover for just $90 down from $140! Get yours now while it lasts! ncludes the latest Kindle without sponsored screensavers ($99.99), a kid-friendly cover ($19.99), and a 2-year warranty provided by SquareTrade ($19.99). Save $39.98 compared to when purchased separately.